a. ^ För Sverige – I tiden has been adopted by Carl XVI Gustaf as his personal motto. c. ^ Since 1 July 2009. Five other languages are officially recognized as minority languages. They are: Finnish, Meänkieli, Romani, Sami and Yiddish. The Swedish Sign Language also has a special status. A military power during the 17th century, Sweden has not participated in any war for almost two centuries. An armed neutrality was preserved in both World Wars. Sweden's long-successful economic formula of a capitalist system interlarded with substantial welfare elements was challenged in the 1990s by high unemployment and in 2000-02 and 2009 by the global economic downturns, but fiscal discipline over the past several years has allowed the country to weather economic vagaries. 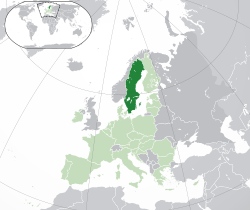 Sweden joined the EU in 1995, but the public rejected the introduction of the euro in a 2003 referendum. Until the second half of the 19th century, Sweden was fairly poor. But far-reaching free market reforms in the 1860s allowed Sweden to benefit from the spreading Industrial Revolution. And so, during the late 19th and early 20th centuries, Sweden saw its economy rapidly industrializing, driven by the many Swedish inventors and entrepreneurs. Another factor which continued Swedish prosperity was the fact that Sweden was able to stay out of all wars, including both World Wars. Sweden is the country with the longest consecutive period of peace since 1809, when Sweden was invaded by Russia, losing Finland in the process. As a result of its free market policies, the resourcefulness of its people, and its successful avoidance of war, Sweden had the highest per-capita income growth in the world between 1870 and 1950, by which time Sweden had become one of the world's richest countries, behind only the United States and Switzerland, and Denmark (who have since also fallen behind because of high taxes). In 1932, the Social Democrats rose to power in the face of the Great Depression. Until 1932, government spending had been kept below 10% of GDP in Sweden, but the Social Democrats, under their leader Per Albin Hansson, wanted to change this and remake Sweden into a "folkhem" ("people's home"), a term Swedish Social Democrats adopted from the Fascists in Italy. Even in the early 1950s, Sweden was still one of the freest economies in the world, and government spending relative to GDP was in fact below the American level. But between 1950 and 1976, Sweden experienced an expansion in government spending unprecedented during a period of peace, with government spending to GDP rising from about 20% in 1950 to more than 50% in 1975. Virtually every year, taxes were increased while the welfare state expanded, both in the form of a sharp increase in the number of government employees and ever more transfer payment benefits. During the first 20 years, this relentless government expansion took place seemingly without ill effect, as Sweden benefited from rapid global growth — although Sweden's growth had already started to slip in relative terms, from well above average to just average. This changed in the 1970s after Olof Palme, from the left wing of the Social Democratic party became Prime Minister. Palme stepped up the socialist transformation in Sweden, rapidly increasing anti-business regulations and sharply increased payroll taxes. The payroll-tax increases, along with increasing wage demands from unions, made Swedish businesses highly uncompetitive on the global markets, something which was to be solved by devaluing the Swedish krona. As a result, price inflation rose sharply, leading to repeated devaluations. After Palme was killed by an unknown assassin in February 1986, pragmatist Ingvar Carlsson became prime minister. Worried that Swedish growth had trailed most other countries, Carlsson's government implemented a number of free-market reforms. Among these were the lifting of all currency controls in 1989 and a tax reform that dramatically reduced marginal tax rates. Although these reforms have arguably contributed to improving the long-term economic performance of Sweden, they would contribute to precipitating the deep economic downturn in the early 1990s. Meanwhile, as the economy started slowing significantly in 1990 after a series of tightening measures, consumer price inflation slowed. With the combination of continued high nominal interest rates, reduced capital gains taxation (and with that, reduced deductions for interest payments) and falling price inflation, real interest rates started rising significantly, helping to end the asset price bubbles. On top of all of this came the oil price shock following Saddam Hussein's invasion of Kuwait and an economic downturn in key trading partners such as the United States, the United Kingdom, and Finland. The end result was that Sweden slipped into a recession in late 1990. In the collapse in November 1992, the dramatic increase in interest rates and the deep recession had at the same time created a large amount of bad loans, making almost all major banks in effect bankrupt. Only after the Swedish government pledged they would bail out the banks with whatever money they needed was a widespread banking collapse averted. The recession became Sweden's deepest by far since the Great Depression, with GDP in 1993 being 5% lower than in 1990, with employment falling more than 10%, and the budget deficit rising to more than 10% of GDP. By then Sweden had fallen to between 15th and 20th place in international income comparisons, a decline from which it has never since recovered. After this deep downturn, a number of free market reforms and budget cuts were implemented and Sweden underwent a recovery. The jobless rate was traditionally very low in Sweden, averaging about two percent. Over the following two decades, however, the official unemployment rate has more than tripled, and the official numbers almost certainly undercount the true rate of unemployment. The McKinsey Global Institute estimated that the real unemployment rate was around 15 percent (as of 2004). Estimates usually put total Swedish unemployment, including the so called hidden unemployment, at somewhere between 15 and 20 percent, about three times above the official unemployment figures. In 2005, Mr. Hans Karlsson, a member of the prime minister's cabinet as secretary of labor, was quoted in Dagens Industri, a major business daily, as saying that about 20 to 25 percent of the work force is unemployed and that most of them are "stashed away" in the statistics on long term sick leave, in labor market programs, or in early retirement and similar programs. High taxes and excessive regulations have encouraged many large corporations to leave the country. Almost the entire pharmaceutical industry has moved: the most significant examples are Pharmacia, which was bought by Michigan-based Upjohn, and Astra, which was effectively taken over by Zeneca. Research and development has moved abroad, while some low tech production has remained in Sweden. The automobile industry met a similar fate in the 1990s: Volvo Cars was broken out of the Volvo Corporation and sold to Ford; GM took over SAAB Automobile. SAAB is already building two of its four models for the American market outside Sweden and Volvo has expanded its Netherlands and Belgium operations significantly. IKEA and TetraPak also moved abroad. IKEA was founded by Mr. Ingvar Kamprad soon after World War II. Having become one of the world's richest men on low price, "self assembly" furniture, Mr. Kamprad has relocated his corporation to the Netherlands. He himself resides in Switzerland. The TetraPak Corporation, founded by the Rausing brothers, gave the world the "sausage stuffing" procedure for manufacturing and filling milk cartons. The technology made the brothers billionaires, and motivated them to relocate to England. By taxing professionals so onerously, the tax system also discourages education. This leads to a lack of highly skilled professionals and mounting recruitment problems in sectors of the economy that are based on human capital. Between 1993 and 2000, emigration of college graduates grew by 48 percent. College graduates account for half or more of recent emigrants, with their share increasing slightly between '93 and 2000. Since then, emigration has continued to grow at 5-7 times the growth rate of the population as a whole, and anecdotal evidence from newspaper reports indicates that college graduates continue to dominate emigration. One of the people who were burdened with this tax was Astrid Lindgren, the famous author of children's books best known for her Pippi Longstocking series. In 1976 she wrote a satirical short story published in one of Sweden's biggest newspapers, where she told the tale of a troubled children's-books author called Pomperipossa, who lived in the fictional kingdom of Monismania. Among other things, Pomperipossa pondered why the more she earned, the less she got to keep, and why people like her were being economically punished by the government simply for writing popular children's books. The story also mentions that in Monismania one could escape some of the taxes by purchasing real-estate property, which is exactly what the Swedish secretary of the treasury, Gunnar Sträng, had been doing at that time. Lindgren's story stirred up a fierce tax debate in Sweden, and for the first time in 44 years the incumbent Social Democratic Party lost the general elections. Before the reform, the government introduced parts of the budget in January. Over the following months, it would introduce further appropriations, sometimes comprising about a third of the overall budget, as they were being finalized. Parliamentary approval proceeded on an item-by-item basis and was typically concluded in June, before the beginning of the fiscal year in July. As a result, aggregate spending and the deficit were unpredictable until the very end of this process. After the reforms in the mid-1990s, parliament would vote first on budget totals before deciding individual appropriations. The first step was for a Spring Fiscal Policy Bill to propose aggregate expenditure ceilings for the upcoming budget plus two further years, as well as indicative ceilings or ‘frames’ for the allocations across expenditure areas. While ceilings were initially approved three years in advance, later has the setting of medium-term ceilings been delayed, officially owing to a pending evaluation of economic growth potential and possibly also to retain flexibility for the period following elections. The Riksdag's work on the budget begins each year with a proposal from the Government. In the spring, the Government's first proposal - the Spring Fiscal Policy Bill with guidelines for Sweden's economic policy and budget policy - is presented. In September, it presents its second proposal, the Budget Bill, which contains the entire central government budget. The central government budget applies for one year at a time, but sometimes revisions need to be made after it has started to apply. In this case, the Government will submit a supplementary budget. The Riksdag has until the end of November to determine the total limit for central government expenditure, as well as the limits for each expenditure area. In mid-December it decides how the money for each expenditure area is to be allocated. In an article (available in Swedish only - pdf) published in the Swedish Economics Association's journal Ekonomisk Debatt in 2009, Ratio Institute economists Bjuggren and Johansson, relying on public data from the government agency Statistics Sweden, they found that there has been no job creation at all in the private sector from 1950 to 2005. They show the effects of the corporate government by identifying what corporations are owned by government and therefore considered, as government-owned corporations, part of the public sector. The data takes the self-employed into account, as well as foreign ownership, both of which are categorized as "private" (whether owned by foreign governments or not). While the private sector has provided zero net job creation, the public sector has seen monstrous growth during this period. The population has increased even more, which explains the higher unemployment rates as well as the great chunk of people of working age pushed into public universities to further "educate" themselves. In response to the current recession were taxes cut, a move according to the critics the country could not afford, the European Commission also warned against this. But instead, the lower taxes were a spur to growth and Sweden now has the fastest-growing economy in the Western world. Tax on low-paid jobs fell sharpest. Nursing assistants, for example, saw their tax bill drop by a fifth. The aim was to make work compete more aggressively with Sweden's famously generous welfare state. (The conservatives won the election with the slogan 'We are the new workers' party,' meaning they would cut taxes for those in employment, but not for those on benefits.) The notorious wealth tax, which took 1.5 per cent a year from any Swede worth over about Skr 1.5 million, has been abolished. When the recession came, Sweden was badly hurt, as one would expect from an export-orientated economy trading with a stricken continent. But the damage was limited because Sweden had properly regulated financial institutions (having been stung by a serious financial crisis in the 1990s). Banks which had embarked on misadventures in the Baltic cleaned up their own mess. The government entered the recession with a surplus, because its laws prohibit politicians running up the national debt in boom years. Unemployment never hit the forecast 10 per cent - it was 8 per cent in July and 7.4 per cent in August, 2010. Two think tanks have confirmed the assessment that the tax cuts have created some 100,000 jobs. The deficit was tumbling as the economy recovered. Extraordinarily, Sweden has now overtaken the United States and reached second place in the World Economic Forum's yearly competitiveness rankings. The Swedish National Debt Office predicted that a stronger economy and increased tax income will lead to the central government budget being close to balance in 2010. In 2011 and 2012, there will be a surplus. Consequently, borrowing will be reduced in the coming years. In the third quarter of 2010, exports, which make up more than half of the Scandinavian country's GDP, increased 11.9 percent and imports 14 percent. Industrial production increased by 9.3 percent. ↑ "Foreign background include foreign-born and swedish-born with two foreign-born parents". Scb.se. http://www.scb.se/Pages/TableAndChart____26041.aspx. Retrieved 2012-09-22. ↑ "Befolkningsstatistik". Statistiska centralbyrån. http://www.scb.se/Pages/Product____25799.aspx. Retrieved 2010-05-18. ↑ 4.0 4.1 4.2 4.3 "Sweden". International Monetary Fund. http://www.imf.org/external/pubs/ft/weo/2012/01/weodata/weorept.aspx?pr.x=92&pr.y=3&sy=2009&ey=2012&scsm=1&ssd=1&sort=country&ds=.&br=1&c=144&s=NGDPD%2CNGDPDPC%2CPPPGDP%2CPPPPC%2CLP&grp=0&a=. Retrieved 2012-04-22. ↑ "Språklagen" (in Swedish). Språkförsvaret. 2009-07-01. http://www.sprakforsvaret.se/sf/fileadmin/PDF/spraklagen_200509.pdf. Retrieved 2009-07-15. ↑ Landes, David (2009-07-01). "Swedish becomes official 'main language'". The Local. thelocal.se. http://www.thelocal.se/20404/20090701/. Retrieved 2009-07-15. ↑ "Är svenskan också officiellt språk i Sverige?" (in Swedish). Språkrådet (Language Council of Sweden). 2008-02-01. http://www.sprakradet.se/servlet/GetDoc?meta_id=2119#item100400. Retrieved 2008-06-22. ↑ 9.0 9.1 9.2 9.3 9.4 9.5 9.6 9.7 9.8 CIA - The World Factbook. "Sweden", from The World Factbook. Referenced 2010-09-29. ↑ Heritage Foundation. "Sweden", Economic Freedom Score. A lower ranking is better; but please be careful when comparing between different countries or years. Referenced 2010-09-29. ↑ Transparency International. "Sweden", Corruption Perceptions Index 2009. A lower ranking is better; but please note that the numbers cannot be compared between countries or years due to different methodology. Referenced 2010-09-29. ↑ Doing Business. "Sweden", Doing Business 2010 (part of The World Bank Group). A lower ranking is better; but please be careful when comparing between different countries or years. Referenced 2010-09-29. ↑ Stefan Karlsson. "The Sweden Myth", Mises Daily, August 07, 2006. Referenced 2010-10-10. ↑ Daniel Mitchell, Ph.D. "Hoping to Restore Growth, Voters Rebel Against Sweden's High-TaxWelfare State", The Heritage Foundation, published on September 21, 2006. Referenced 2010-10-12. ↑ McKinsey Global Institute. "Sweden's Economic Performance: Recent Development, Current Priorities" (pdf) McKinsey Global Institute, May 2006. Referenced 2010-10-12. ↑ 16.0 16.1 Sven R Larson, Ph.D. "The Swedish Tax System: Key Features and Lessons for Policy Makers" (html, pdf), Center for Freedom and Prosperity Foundation, June 2006, Vol. VI, Issue II. The article referred to this article (in Swedish) for its claim. Referenced 2010-10-12. ↑ Joachim Wehner. "Budget reform and legislative control in Sweden", Journal of European Public Policy, 14:2, March 2007. Referenced 2010-12-12. ↑ The Swedish Parliament. "The budget process", April 2008. Referenced 2010-12-12. ↑ Per Bylund. "Stagnating Socialist Sweden", Mises Daily, January 11, 2011. Referenced 2011-01-11. ↑ Fraser Nelson. "Swedish conservatives bucked the recession by lowering taxes – and won re-election", The Spectator, 25th September 2010. Referenced 2010-12-08. ↑ Swedish National Debt Office. "Sweden's budget returns to surplus in 2011", Press release, 2010-11-16. Referenced 2010-12-08. ↑ Johan Nylander. "Sweden’s economy booms – GDP up 6.9 percent", The Swedish Wire, 29 November 2010. Referenced 2010-12-08. ↑ Carmen M. Reinhart and Kenneth S. Rogoff. "This Time is Different", Princeton University Press, ISBN 978-0-691-14216-6, p. 383-384. (The list does not claim to be complete.) Referenced 2011-07-21. ↑ Carmen M. Reinhart. "This Time is Different Chartbook: Country Histories on Debt, Default, and Financial Crises" (pdf), March 3, 2010, p. 106. (The list does not claim to be complete.) Referenced 2011-07-21. ↑ World Bank. "Sweden: GDP", from World Bank Data. Referenced 2010-09-29. ↑ World Bank. "Sweden: government debt", from World Bank Data. Referenced 2010-09-29. ↑ World Bank. "Sweden: government revenue", from World Bank Data. Referenced 2010-09-29. ↑ World Bank. "Sweden: government expenses", from World Bank Data. Referenced 2010-09-29. This page was last edited on 28 October 2014, at 15:46.